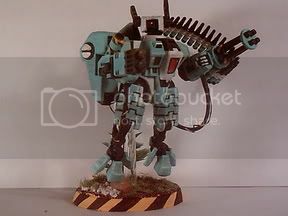 Nice clean colours, and a good scheme. Not sure what&#39;s going on with the wirey things going from his arms to his feet, but I&#39;m sure there is a good explanation for it. The hose goes from the arm to the jetpack in back. I got the idea off of the Dragonminiatures website...the guy had just a little bit hanging, but I wanted mine to hang a lot lower. I&#39;ve shortened them a little on the next 2, but I still want that same effect. 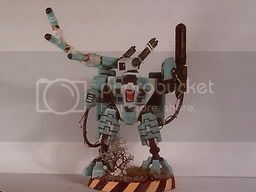 very nice, especially for it being your first crisis suit. the &#39;jewel&#39; effect on the middle of the crisis Suit is very good. I am not a big fan of those colours but they do work, partly through some good clean painting. Oh yeh, and one thing that hasn&#39;t been mentioned, I like the camo strips (is that what they are?) on the missile pod! They look excellent! really nice, though its kinda hard to see any highlightning.. Agreed for all the points... The idea of external power cords or ammo clips is very cool, and looks good too. 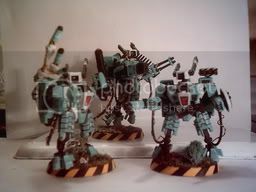 Considering any weapon or system can be mounted on them, you would assume they would be modular and reloading/power supply would have to reach them by some other means. All in all a very good bit of work.